What energy can you BE in your life this year that will create more for you? 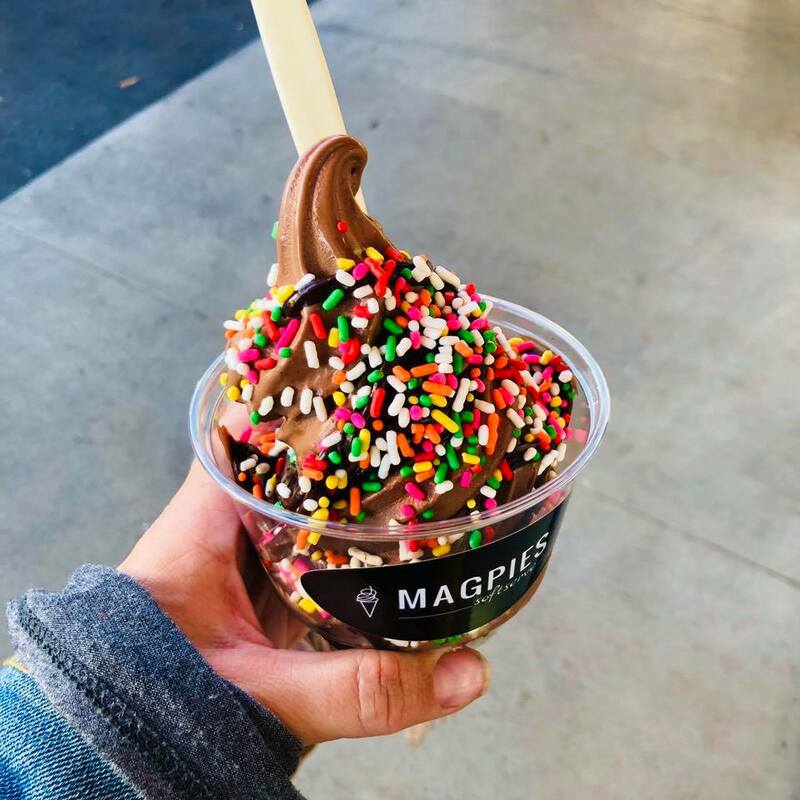 Yesterday I treated myself to soft-serve with colored sprinkles in the middle of the afternoon because the was a match to the energy I’m choosing to BE and to have more of — JOY! I didn’t plan on that sweet treat — it popped up as a possibility and I choose it. That’s me following the energy. I am interested in JOY. I’m choosing to BE the energy of JOY. And as I embody joy, I naturally perceive the possibilities that will generate more joy. 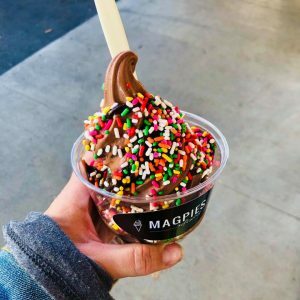 THAT’S what had me choosing soft serve with sprinkles. What energy can you BE that will create more for you? That’s January’s Question of the Month that I’ve posted on my Facebook business page. Ask that question with me all month long and see what it creates for you. Also, if this is the year you’d like to practice following the energy, acknowledging your awareness, asking questions, and choosing with consciousness, take a class with me. Alignment, a daily practice class begins Saturday. Body and Money, a ten week series begins on January 22. 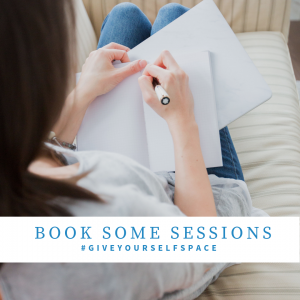 And if you want to book a package of new year-new you sessions, choose it! I’m here, and a series of sessions all about who you are BEING in your world just might be the best investment you could make in you. What are you creating next? The energies you have available. We pay attention to what’s under the surface. You become more and more clear. Would space like that be a kindness to you? Would it create more in your reality? If so, book some sessions. Once a week, once a month, once a quarter? Use them as you choose. Would you like to start the year with a fresh wave of energy? Tapping into abundance? Anchoring yourself in some daily practices of HAVING and RECEIVING — more!? I taught a 21 Day class in November that was one of the most potent classes of the year. In that month so much in my world changed, I was in awe! I found a new home, I moved, I got all new furniture, and everything I had been making hard, became EASY! That is the energy of abundance. No scarcity. No lack. No contraction. It’s the class that keeps on giving. But, of course — that is what abundance is. It’s an overflow of energy that is always there for us. And it doesn’t stop giving. We just shut down our receiving. And that is a choice. If YOU would like to play with these 21 recording too, please — HAVE it! 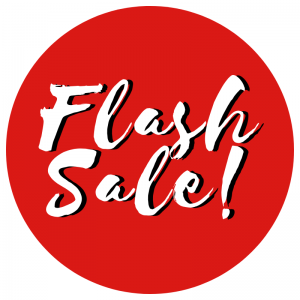 And to make it ease for you, I’m putting it on SALE! 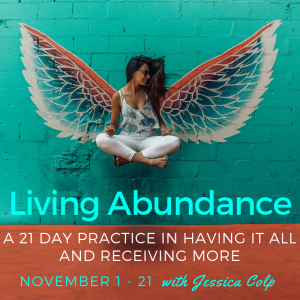 Living Abundance: a 21 Day Practice in HAVING It All and RECEIVING More consists of 21 class recordings all available for you in Dropbox to keep. Listen to one a day for 3 weeks and steep yourself in questions, awareness, choice and possibility. You’ll hear our stories, and you can let yourself be right there on the journey with us! 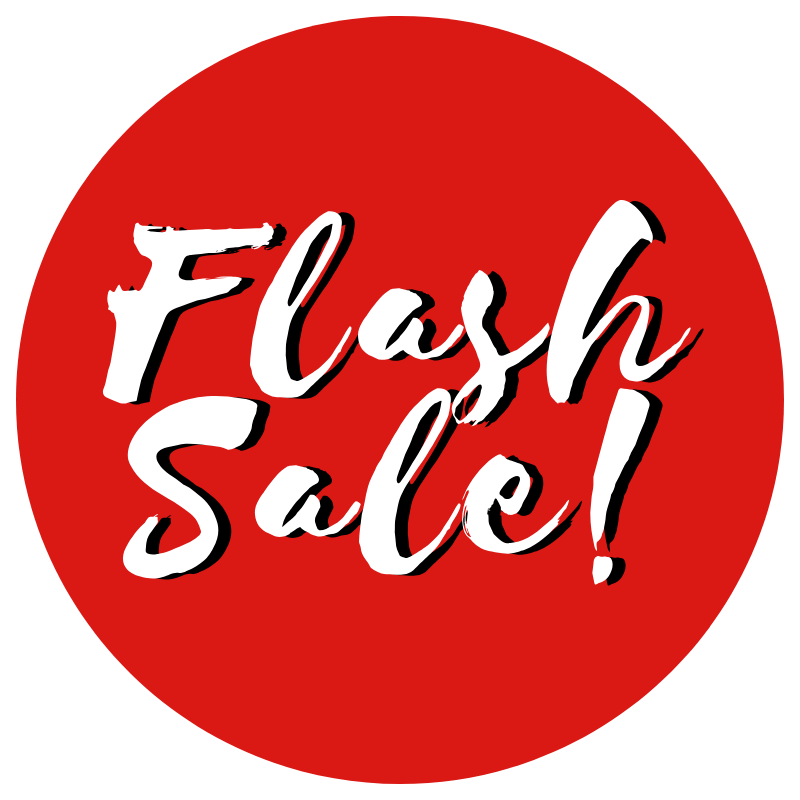 For this week only, have it for $99. You changed this year! Have you created the space to acknowledge that? Who are you now at the end of 2018? And how are you different from the beginning of the year? This time of year, the days are shorter, and holiday festivities keep me busy, but before the year winds down, I like to pause and reflect – a LOT! What did I choose this year? Can I call it all good before I step into a new year? To me, that’s important and grounding. If creating space for that kind of end of year reflection and visioning lights your fire too, join me from Solstice to New Year’s Day in a light-filled daily practice class. 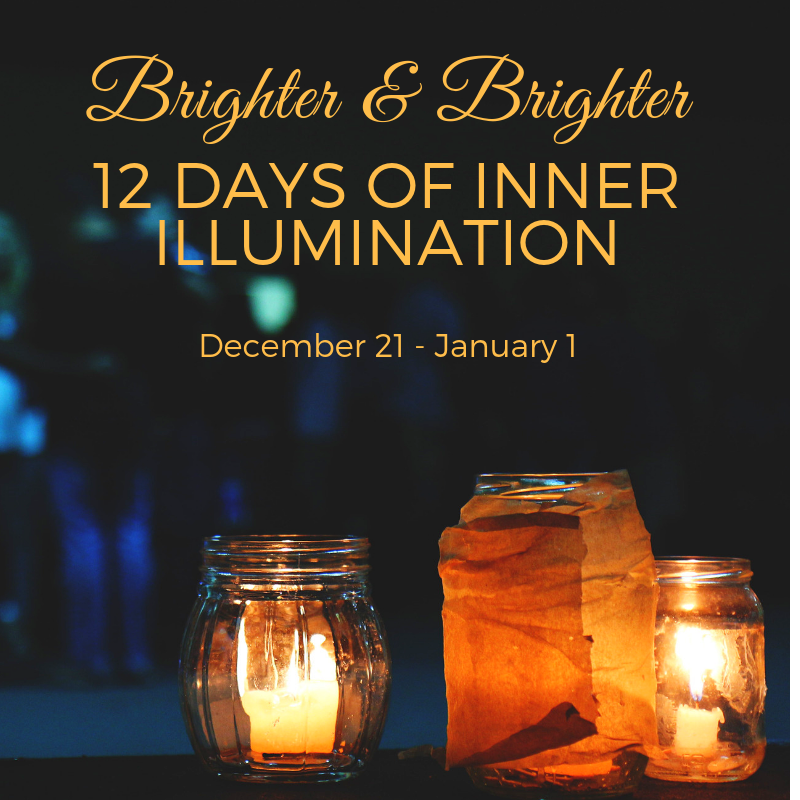 12 Days of Inner Illumination begins Friday. Class includes content, consciousness tools and sharing. You can join us live at 8am Pacific, or catch the recording and play in the exercises at any point in the day that works for you. Or simply say YES and choose it! Even those experiences of the last year that felt like disappointments or mistakes have gold for you. Release any judgment of yourself or of Life and receiving that gold is so much easier. I know that’s hard to do sometimes, but perhaps a group experience where we are ALL in that work together is just what you need! 😉 Ask and know. It was ME that had to change… not the circumstances. I often remind clients that if you want something different in your life, you have to BE different. You have to be willing to change your points of view, your way of interacting with the world, and even your personality and identity, in order for your dreams to come true. I had to remind myself of that last month… and change myself! In October I was looking for a new home in Los Angeles. I was supposed to move out of my apartment by the end of the month, but I wasn’t finding my new place. My experience was this: everything on the market was ugly, or inconvenient, or too expensive, or in a neighborhood I didn’t want to live in. I knew what I was looking for, and I wasn’t finding it. Now, here’s the thing — I DID know what I was looking for energetically, but I was also holding on to an idea of what I thought it should look like. I was looking for something like what I had had. I thought my new home would be a duplex or a guesthouse, or a small homey looking apartment building in a sweet neighborhood, and nothing like that was showing up. One day, a week after I was supposed to have already moved out, I was so frustrated, I set out on my daily quest of looking at apartments, but this time I let myself give up my expectations. I knew I had to approach this search differently, so I softened and surrendered. “Today, I’m interested in beautiful places to live, no matter where they are or what form they come in,” I said aloud. In that was a willingness to expand my gaze and see what I hadn’t been seeing. The first place I stopped was in a neighborhood in Glendale I’d recently discovered, but it was a BIG apartment complex — the kind of building I was sure I did NOT want to live in. Parking was easy, the leasing office was open, the leasing agent Rachel was available, and she walked me to an apartment that stunned me! What?! This is BEAUTIFUL! It totally has the energy of what I’ve been looking for! Could I live here? Four hours later, I was approved, with a moving date that weekend. It was that easy. There’s so much more I could share about the miracles of this new home (the ease of moving in, the special the complex offered me, the furniture I bought that weekend that goes perfectly, the beauty of this new neighborhood), but do you get the essence of my story? I had conclusions about what I was looking for, that I couldn’t see past, until that one day I CHOSE to look past them. I’m willing to see what I’m not seeing. I’m willing to become something different than what I think I am. I’m willing to to be surprised by what I can have and become. I’m giving myself amnesia about all of my conclusions now. EVERYTHING I’VE BEEN ASKING FOR!!!! I’ve been in this new home for a few weeks now, and I feel like I’m living in a village. I like the big building, my balcony view of the city, my living room fireplace and super modern kitchen. I’m surprised by it all. It’s the upgrade I’d been asking for, and I’m amused that I almost wasn’t willing to have it. What can you let go of today so that you can receive what you’ve been asking for? Conclusions about what things should look like? Set points of view that limit your options? Notice what lands in your life when YOU choose to be different. If my story is helpful to you, I’d love to know. And, I’d also love to have you join me in any of the class offerings I’ve got on the calendar this month. Check them out HERE. Could you use some space? 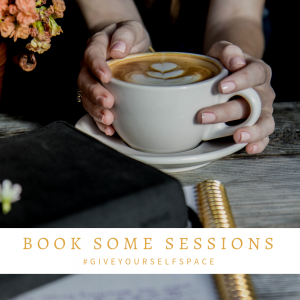 Would it be a kindness to yourself to book some sessions? Sessions are your place to lay it all out, hear yourself, receive perspective, and shift energy. Sessions give you the space to relax, to expand, to breathe. How’s it going? Check your abundance meters! Are you letting yourself have the abundance life is giving you? I experience abundance as more than enough. it’s having all my needs met and a sense of well-being and fullness. It’s money. But it’s more than that. It’s an overflowing space of possibility. There is no shortage. There is no lack. Everything is here now, and I am grateful. I receive it all and expand into more. That’s abundance! It’s an ENERGY! Can you tap into that right now? The crazy thing about THAT energy is that it’s available ALL THE TIME! Yet, very often we don’t choose it. And of course we don’t — the circumstances of our lives are so distracting – bank balances, unexpected bills, to-do lists that we can’t keep up with, and overwhelm. When we collapse and see only the surface problems, we get nervous. The clench of worry and fear is the bad habit of scarcity. Anxiety generates more scarcity and fear, and, Friends, I know…. climbing out of that rabbit hole can take some work! Living the energy of abundance in your life is a choice you can make easily and quickly with practice. It’s an energetic state that you can be so familiar with, it’s easy to choose when you catch yourself clenching in worry or collapsing in overwhelm. And the beauty of this simple choice is that BEING the energy of abundance is what actually shifts your circumstances. First you BE it, then you create it. It doesn’t work the other way around. Be the energy of abundance by opening up, turning on a flow of gratitude, delighting it what you already have. From there the bills get paid more easily, the projects at work smooth out, the kindness of strangers makes it way in, and the things that were problems before aren’t any more. Be it. And the worlds changes. 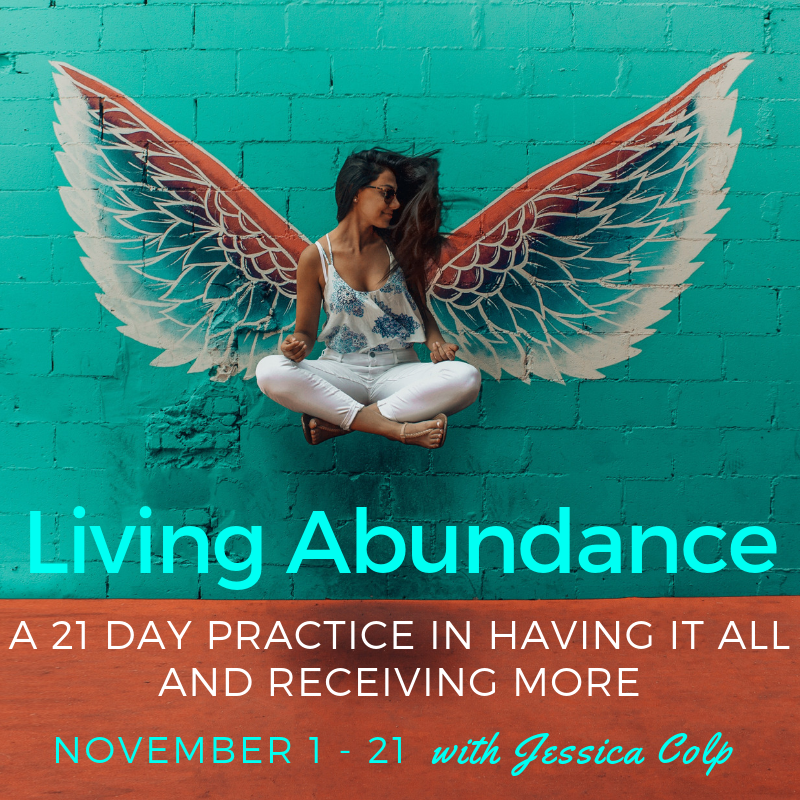 Starting Thursday, November 1, BEING the energy of abundance is our aim for 21 Days in a row. Would you like to join us? The class is Living Abundance: a 21 Day practice class in HAVING it all and RECEIVING more. Or book some abundance sessions this month. I’d love to have one on one time with you to talk about all the stuff you’re perceiving as ‘problems’ that don’t have to be. it’s your life. Embrace it with the energies that actually create more for you. Are you asking big questions about your life? Are you looking under the surface and re-evaluating where you are and why? If you’re questioning yourself and your life, give yourself the kindness of a listening ear. When you have the space to talk that out, it gets easier. 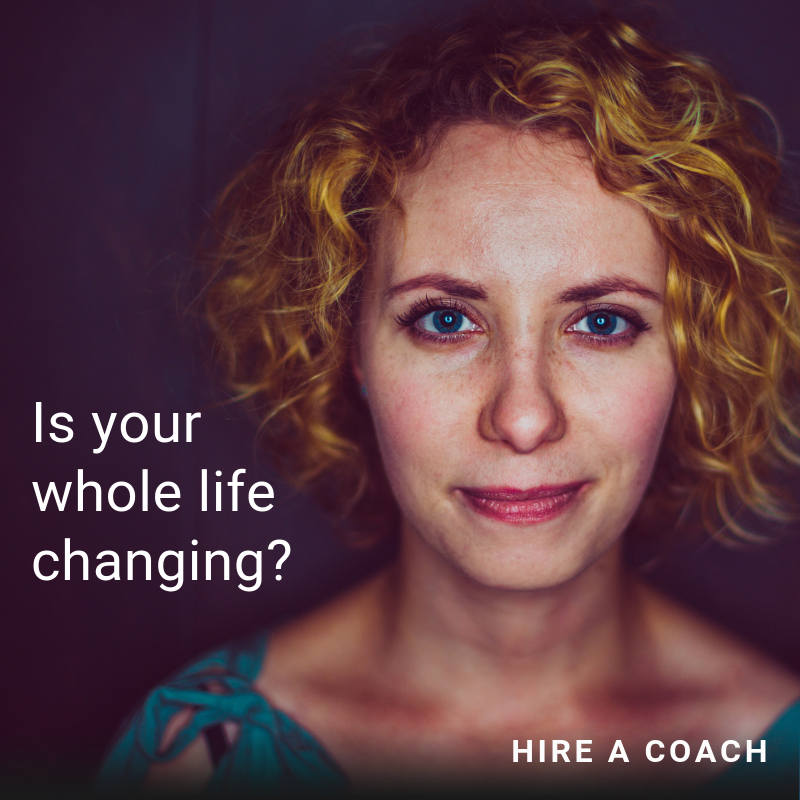 In a coaching session you explore the big questions. You reach into the unknown. You get curious about what else is possible. You let the big questions to propel you forward into something greater. 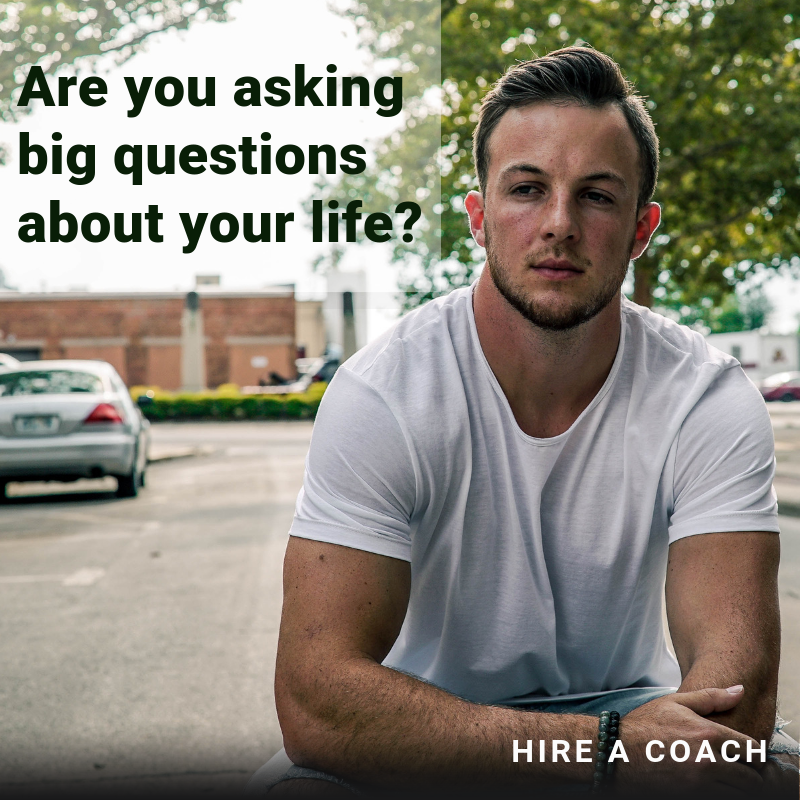 If you’re ready to dive into the big questions with support, book a session with me. Our first conversation is 75 minutes for $150. What’s going on in your world? Anything changing? It is in my world. Some of the change this year was change I knew was coming. Some of it has caught me by surprise. Can you relate? My job, as I see it, is to stay present and be aware through all the shifts and changes. The earth can move under my feet. Structures of my life can dissolve. And, I can still stand tall, be flexible, and stay conscious through it all. Yep! It’s not a bad thing… even if it temporarily rocks you. I’ve been lifting my gaze to the horizon a lot, asking a lot questions. Where am I going with my life? What am I aiming for? Big questions actually steady me. They guide me forward and help me navigate change. 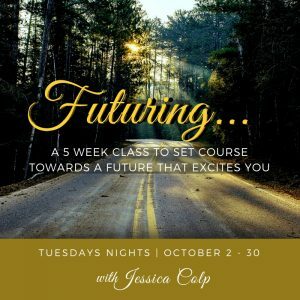 What am I creating as my future by my choices? What could I have five, ten, fifteen years from now if I head towards it now? And what else could I choose that will expand me, add to my life, bring me joy? I like asking these questions. I like perceiving the ‘next grandest version of my life’ ahead of me in the future. And as I perceive it, I know I’m bringing it to life. My future begins to brighten and beckon me forward. I follow that energy and it informs my path now. That’s what I’ve been working on — asking a lot of questions about my future, perceiving what’s possible, and spending time in that energy. I’ve done it before — I’ve aimed for a whole new reality and a very different version of my life. I created what I envisioned, even thought at some point it seemed impossible. I bet you have too! Is it time to vision again? 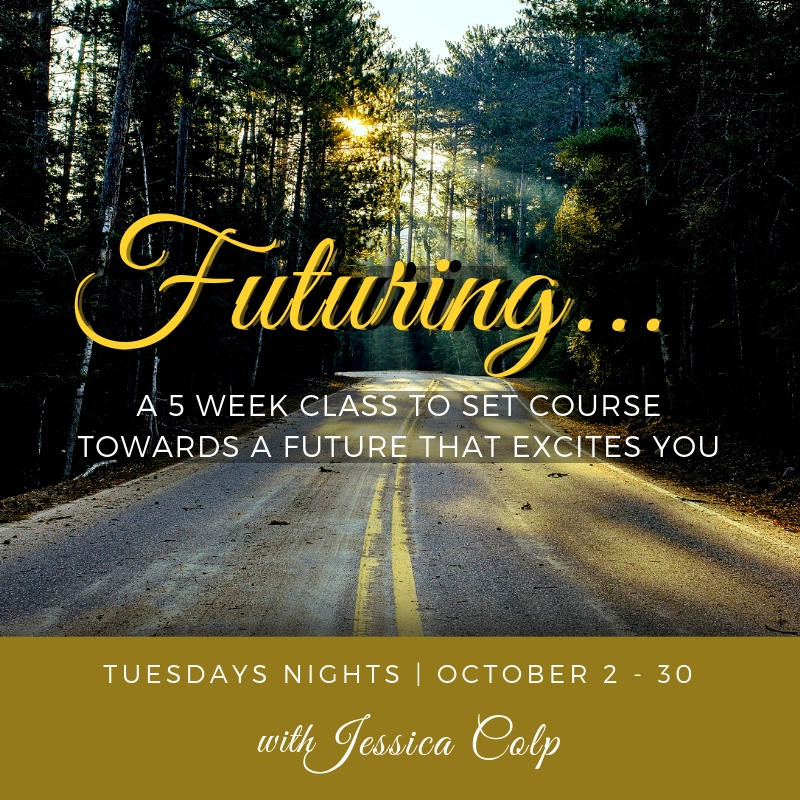 To set course towards a future that excites you? If it is, join me for a 5 week Futuring Class in October or book some sessions. If your view of the future doesn’t light you up and pull you forward, pause and ask yourself more questions. Point yourself another direction. Choose greater. It’s your life. You get to create it. 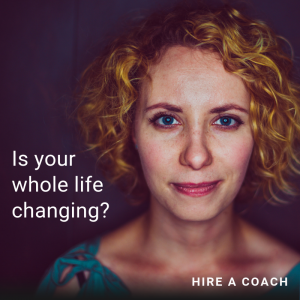 Is your whole life changing? When you’re riding the waves of change, get support. You’ve got the strength inside of you to walk through whatever comes up in your life. You can meet even the most unexpected circumstances with inner resilience. You can flow with change, instead of resisting it. You don’t have to have all the answers. You don’t have to feel totally sane all the time. Your Life Coach will remind you of what you’re aiming for. In sessions, you’ll lay it all out and look at it together. You’ll get present to what’s really important. You’ll perceive the bigger picture. You’ll access your knowing. You’ll find your feet under you and stand up tall. The ground beneath you may be different, but after a big change, you just may be more YOU. If you’ve never worked with me before, schedule a 20 minute phone consultation HERE. Or just hop into my client calendar HERE and we’ll dive in!